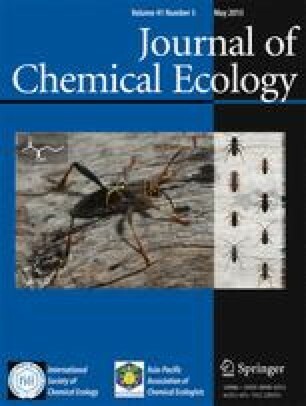 Each of 10 (Z,Z)-9,19 hydrocarbon dienes (28–37 carbons) found in female yellowheaded spruce sawflies,Pikonema alaskensis (Rohwer), was synthesized and found to be attractive to males by field bioassay. These dienes oxidize slowly in air, major products being aldehydes. One product common to all the dienes, (Z)-10-nonadecenal (Z10–19∶Al), and one from the 29-carbon diene only, (Z)-10-eicosenal, initiated flight and caused upwind anemotaxis in males in a greenhouse bioassay.Z10–19∶Al was incorporated into Hercon® controlled release formulations and was active in the field. The aldehyde could be useful for monitoring sawfly populations. Pikonema alaskensis (Rohwer) (Hymenoptera: Tenthredinidae). Paper No. 13,072, Scientific Journal Series, Minnesota Agricultural Experiment Station, University of Minnesota, St. Paul, Minnesota 55108.